There is a terrible tragedy about to happen to Earth. A small planet, also called an Asteroid is speeding toward Earth. This particular Asteroid was one of many small planets revolving about the Sun between the orbits of Mars and Jupiter. Somehow, this Asteroid jumped its orbit and is now threatening the life of every living soul on earth. The only way to stop the Asteroid is to blow it up in Space before it gets to Earth. As an Astronaut, you are assigned the duty of rocketing to the Asteroid and blowing it up. There is no time to lose, though. If you don't do things exactly right and don't travel fast enough, there will be DISASTER. the Asteroid will hit Earth at a pre-determined time. You are wearing a watch, which if checked periodically, will let you know how much time you have left. Be careful, don't waste time, and you will save us all from certain destruction. Good luck! 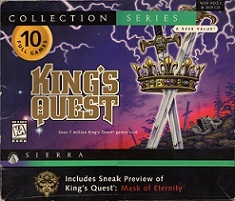 Despite being the third Hi-Res Adventure developed by Ken and Roberta Williams in 1980, when Sierra was still called On-Line Systems, the game was titled Hi-Res Adventure #0. The reason for numbering it zero, is because this game was more of an introduction to Hi-Res Adventures. The game is much shorter and simpler than its counterparts in the Hi-Res series. 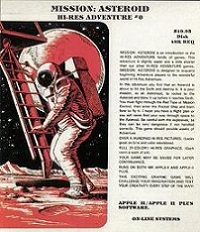 The game was first released for the Apple II in a small folder in 1980, and later re-released for the Atari in the same small folder. Again around 1982 it was released in a large folder under the SierraVenture series and in a box under the new Sierra On-Line name. 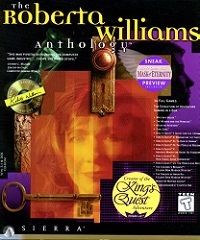 It was also included, along with other Hi-Res Adventures, in the 1997 King's Quest Collection and the Roberta Williams Anthology.